For maintaining your septic tank in between the two year pumping Mick Gage Plumbing and Heating recommends BIO-CLEAN. The bacteria in BIO-CLEAN is specially selected to digest a larger variety of waste, and metabolize it faster than naturally occurring bacteria or yeast additives in your septic tank. Oils, fats, grease and paper are very difficult for intestinal bacteria to handle. BIO-CLEAN is very effective on these materials. It increases solids destruction. More complete digestion also means fewer undigested solids leaving the tank. These solids would otherwise form a black gooey accumulation in the leach field and prevent water absorption by the soil. 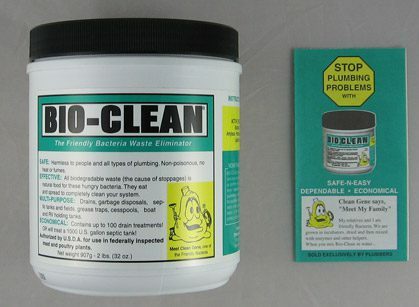 Therefore, BIO-CLEAN extends the life of a leach field. A 2 pound container treats 1,000 gallon septic tank. We have BIO-CLEAN at each of our two locations. The only way to keep the septic tank functioning properly is to have the tank solids pumped out and properly disposed of. While the need for pumping depends on many factors such as usage, size, and wastes added, it is recommended by local health authorities and the Environmental Protection Agency that a system be pumped every two years.